Languages in which we work. Certified Arabic Translation in Delhi (NCR) by Approved Translators. Information about Online application of Birth Certificate for Delhi. Punjabi to English Certified translation of Birth Certificate for Immigration. Applying for Visa at Austrian Embassy and have your documents in English or any other regional Indian language like: Punjabi, Gujarati, Marathi, Malayalam, Kannada, Oriya, Hindi, Tamil, Telugu or Urdu etc. which you want to translate to German language ? You are at right place, we translate all types of documents from Indian languages and English to German to be used at Austrian Embassy or Consulate in India. Your documents before translation requires to be attested or Apostille by Ministry of External Affairs, New Delhi. If you have got your documents attested then you are good to scan them from both back and front side and send to us by email. If you are looking for document attestation services for Austrian Embassy, we also provide this service. Translation of both document and its Apostille is required to be attached with original while submitting documents to Austrian Embassy. We translate documents of all Indian cities and states as well documents from Sri Lanka, Bangladesh, Nepal and Bhutan. We translate documents from all Foreign languages to English or German for Austrian Embassy and consulates in India. Translation requirement to us mainly come from Delhi, Punjab, Mumbai, Bangalore, Hyderabad, Ahmedabad, Pune, Kochi, Chennai, Gurugram etc. but our services are available in all cities in India and abroad. 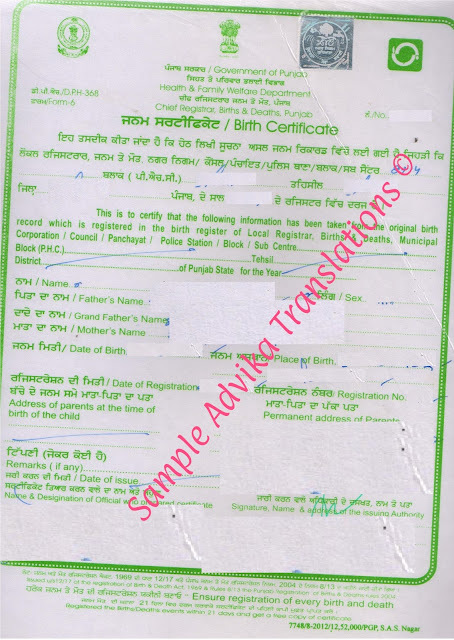 Is your Birth certificate in Punjabi language and you have been asked for its official or certified translation ? Advika Translation is the best translation company for certified or Official translation of birth certificate from Punjabi to English language for use in foreign countries like: US, UK, Canada, Australia, New Zealand, Germany, Italy, Argentina, Cost Rica, Angola, Singapore, Malaysia, France, Saudi, UAE etc., because our translations are acceptable by Embassies, High Commissions and Consulates of all countries in India and all the departments of these respective countries. Not only this we also help in getting Birth certificate or Translation of Birth certificate attested by MEA, Apostille, Embassy or Red Ribbon Notary Attestation. If you are applying for Visa, Immigration or PR to any foreign country you should get your and your family members birth certificate translated to English or the Official language of the country you are applying for. Because this is the most common and most important document which is required by Embassies at the time of Visa process and later on once you reach that country it is again required time to time for official use in foreign countries. Birth Certificate is issued by the Health department of Municipal Corporation of the district of States where birth take place. It is mainly signed by Registrar or Sub-Registrar of Death and Births. Although we translate birth certificate from Punjabi to all Foreign languages but we mainly receive cases for translation of Birth certificate from Tamil to English, French, Spanish, German, Russian, Portuguese, Polish, Czech, Arabic, Chinese etc. We have special service of translating Birth Certificate from Punjabi language to English and getting it attested by Punjab Bhavan in Delhi. This is mainly required by the candidates applying for Passport at Passport offices in Delhi, Gurgaon, Noida, Faridabad, Ghaziabad etc. Our services are available in all the cities and states of India and abroad, so no matter in which part of this world you are seeing this post, we are just a call or email away from you. Certified Punjabi to English Translation of Birth Certificate. 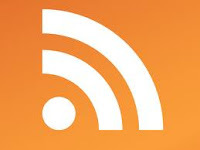 Moga, Mansa, Barnala, Patiala, Sangrur, Amritsar, Bathinda, Faridkot, Firozpur, Ludhiana, Rupnagar, Gurdaspur, Jalandhar, Pathankot, Fazilka, Hoshiarpur, Kapurthala, Tarn Taran, Fatehgarh Sahib, Sri Muktsar Sahib, Shahid Bhagat Singh Nagar, Sahibzada Ajit Singh Nagar, Sunam, Rajpura, Phagwara, Khanna, Malerkotla, Abohar, Batala, Panchkula. Tamil to English Certified translation of Birth Certificate for Immigration. Is your Birth certificate in Tamil language and you have been asked for its official or certified translation ? 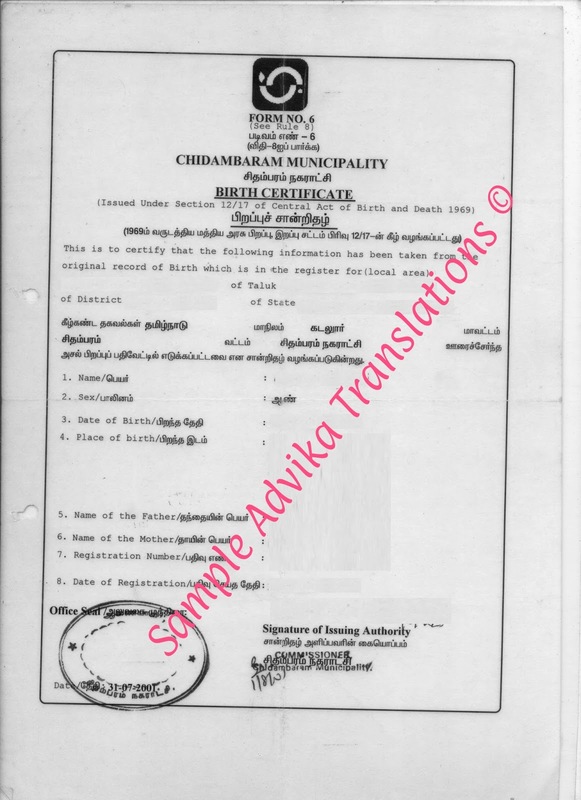 Advika Translation is the best translation company for certified or Official translation of birth certificate from Tamil to English language for use in foreign countries like: US, UK, Canada, Australia, New Zealand, Germany, Italy, Argentina, Cost Rica, Angola, France, Saudi, UAE etc., because our translations are acceptable by Embassies and Consulates of all countries in India and all the departments of these respective countries. Not only this we also help in getting Birth certificate or Translation of Birth certificate attested by MEA, Apostille, Embassy or Red Ribbon Notary Attestation. Although we translate birth certificate from Tamil to all Foreign languages but we mainly receive cases for translation of Birth certificate from Tamil to English, French, Spanish, German, Russian, Portuguese, Polish, Czech, Arabic, Chinese etc. Birth certificate in Tamil Nadu can be registered and issued online from http://www.chennaicorporation.gov.in/online-civic-services/birthCertificate.do?do=ShowBasicSearch , also you can search and verify your birth records from this portal by entering few details. Advika Translation is the best translation company for certified or Official translation of birth certificate from Kannada to English language for use in foreign countries like: US, UK, Canada, Australia, New Zealand, Germany, France, UAE etc., because our translations are acceptable by Embassies and Consulates of all countries in India and all the departments of these respective countries. Not only this we also help in getting Birth certificate or Translation of Birth certificate attested by MEA, Apostille, Embassy or Red Ribbon Notary Attestation. 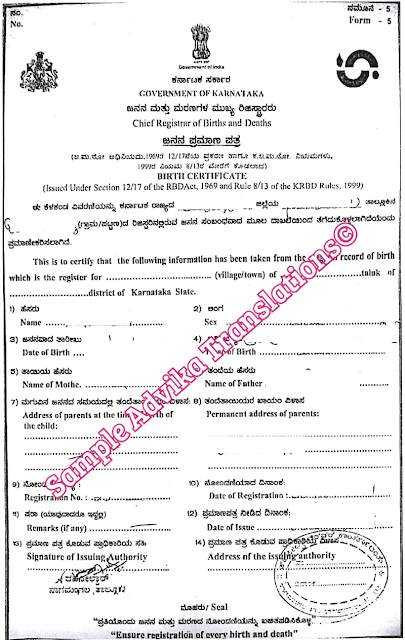 Although we translate birth certificate from Kannada to all Foreign languages but we mainly receive cases for translation of Birth certificate from Kannada to English, French, Spanish, German, Russian, Portuguese, Polish, Czech, Arabic, Chinese etc. Are you looking for Certified translation of Company Incorporation Certificate ? We at Advika Translations, translate Company Incorporation Certificate from all Foreign languages like: German, French, Dutch, Spanish, Russian, Turkish, Chinese, Japanese, Polish and Portuguese etc. to English language and vice versa. Our certified translations can be further used for submission to Income tax Department, Banks, Insurance companies, Embassy, Government department in India and abroad for Official, Legal, Immigration purposes. Our services are available in all cities and states of India and have express services available in Delhi, Mumbai, Pune, Bengaluru, Hyderabad, Chennai, Cochin, Gurugram, Noida etc. A company incorporation certificate is a piece of legal document which establishes the existence of company under the Company Act of respective nations. It is only after the issuance of this certificate that a company’s legal identity is established and it can carry on its business on a corporate front. To get this certificate you are required to fill out an application, submit the respective fees and after the approval of the concerned authority, you will get the certificate which means the name of your company has been registered in the official database. What Does Company Incorporation Certificate Contain? Although the template of this certificate may differ from nation to nation, however, every piece of document definitely will contain the name of the organization followed by an official company registration number. These two things will at any cost be present in every company incorporation certificate. Aside from the above-mentioned information, the certificate is sure to contain the place of registration the type of company established, the Act under which the company has been approved and registered. Finally, it contains the signatures of the registrar along with the date at which the registration has taken place. When is Company Incorporation Certificate Required? In order to get a loan from the bank on your company’s name you will be required to present this certificate of incorporation to them. The certificate of incorporation will be verified by the bank officials and only after the submission of same will you be able to get any loan in your company’s name. In some cases, you might be also required to submit an attested copy of this document along with the loan application form, for successful processing of same. Similar to getting a loan from a bank you will be required to submit this certificate of incorporation for opening a bank account in your company’s name. If you plan on opening a company account in an offshore bank, the bank may ask for the translated copy along with the embassy attestation, only after which they will open your account. For selling the shares of your company to new investors you will be required to produce the certificate of incorporation only after which the selling of this shares will be deemed as legitimate. For selling your company to anyone or acquiring new companies you will be required to produce the certificate of incorporation only after which this transaction will be deemed as legal. This document is one of the most important pieces of paper especially for someone working in the corporate sector. Types of Company Incorporation Certificate. The certificate of incorporation is a single piece of document which is more or less similar in every country. However, the type of company being registered differs from nation to nation based on the Company Act they have in their respective system. For example, in India, a company can be registered as a private holding or a public holding. Further, it can be an associate company or a subsidiary. Therefore the category of the company only differs while all other aspects remain more or less the same. Thinking of expanding your business abroad? Or planning to set up a partnership with any foreign organization? For each of this or anything similar, you will be required submitting a translated company incorporation certificate which ought to be legalized by the embassy. This document will only then be considered for legal use in any foreign nation. Advika Translations helps you through this complete embassy legalization and translation process, thereby allowing you expand your business comfortably. Reach out to our team of professionals for an all-around service with regards to company incorporation certificate translation and or visa services and we would be more than happy to assist you with same. Are you looking for Certified translation of Police clearance Certificate (PCC) ? We at Advika Translations, translate Police clearance Certificate from English and all Indian languages to foreign languages like: German, French, Dutch, Spanish, Russian, Turkish, Chinese, Japanese, Polish and Portuguese etc. and vice versa. Our certified translations can be further used for submission to Embassies and Consulate, FRRO, Immigration Offices, Government department in India and abroad for Official, Job, Legal, Immigration and PR purposes. Our services are available in all cities and states of India and have express services available in Delhi, Mumbai, Pune, Bengaluru, Hyderabad, Chennai, Cochin, Gurugram, Noida etc. We also help in Apostille, MEA, Attestation of PCC from Ministry of External Affair India for submission to any Embassy or Consulate in India. A police clearance certificate is a document issued by the police officials of any particular nation to the citizens who wish to apply for a passport or foreign visa in the nation. This piece of document is issued by the police after a thorough background check and is meant to enumerate or portray any charges ever filed or pending against the person concerned. One can request for this certificate by the police who can then carry on the background check and may even charge a nominal fee for issuing this certificate. What does Police Clearance Certificate tell? A police clearance certificate as mentioned before tells about the criminal history of any person if present. This certificate helps the authorities concerned determine whether to move a particular candidate’s application forward or not. A PCC generally contains basic contact information of the person involved such as the name, phone number, parent’s name along with the complete address of the individual. It does then contain the mention of any criminal charges if filed or still present for the individual. If not then it declares the person fit and eligible for further processing. Where is Police Clearance Certificate Used? A police clearance certificate is known to be used and asked for at numerous organizations and authorities. Some of the places where you will be required this document are mentioned below. A PCC is definitely required in most of the nations by the people who wish to obtain a valid passport. PCC is issued to the candidate after the verification by the police officials and hence after issuance of this you can go and submit the certificate to the respective authorities soon after which you will receive your passport. Generally, an attested copy of this is also required to be submitted hence make sure you have the same with you during the time of applying. A PCC is also asked by a few nations as well as the embassies of these nations before they can issue the visa to any candidate. You will require submitting this certificate only after which you will get a visa for employment or study. A tourist visa doesn’t usually require a PCC unless specifically asked by the authorities. If you have a PCC issued in local language then for certain embassies you will require submitting a translated PCC copy only after which your visa application will be further processed. Certain companies may require a PCC by the respective authorities so as to have a knowledge about their employee’s background. Therefore is asked you will require getting a PCC from the local police authorities. Types of Police Clearance Certificate. There is generally a single type of police clearance certificate seen in across any nation. The certificate in every nation will contain more or less similar information, however, the presentation format may differ. This certificate is of only one type and can be obtained from the local police authorities and Regional Passport office after applying for same. In India, Police clearance certificate or Character certificate is issued either from Regional Passport Office or Local Police station of your area. As we have mentioned above, you will require submitting a translated copy of PCC during your passport and visa application process. You can reach out to well-reputed companies such as Advika Translations which will help you through the entire PCC translation and attestation process, therefore, making the process of getting a legal passport or visa a piece of cake for you. Are you looking for Certified translation of Medical Certificate ? We at Advika Translations, translate Medical Certificate from English to all foreign languages like: German, French, Dutch, Spanish, Russian, Turkish, Arabic, Chinese, Japanese, Polish and Portuguese etc. and vice versa. Our certified translations can be further used for submission to Embassies and Consulate, FRRO, Immigration Offices, Government department in India and abroad for Official, Job, Legal, Immigration and PR purposes. Our services are available in all cities and states of India and have express services available in Delhi, Mumbai, Pune, Bengaluru, Hyderabad, Chennai, Cochin, Gurugram, Noida etc. We also help in Apostille, MEA, Attestation of Medical Certificate from Ministry of External Affair India for submission to any Embassy or Consulate in India. A medical certificate is nothing but a piece of the document from a qualified doctor or physician certifying as well as reporting the results of a medical examination conducted on a person. This document is used to determine the fitness condition of an individual and or report any health condition caused by him. This piece of document is used throughout the globe for a variety of purposes some of which we would be discussing under. What Does All Medical Certificate Contain? A medical certificate is definitely known to contain the name of the individual to whom it was issued along with the date on which the same was issued. This information is usually printed on the letterhead of the doctor examining the patient and or the hospital where the examination did take place. Aside from this, it is known to contain the information pertaining to the issue or illness from which the patient is suffering along with the possible time of recovery. If fit then the last part is usually skipped and instead a fitness report is issued by the physician involved. Where is Medical Certificate used? To get all those health benefits from your company to which you have been paying installments you will require submitting a medical certificate stating your condition to the company. It is only after the submission of same that you would be able to obtain the insurance amount. In order to obtain a driver’s license, you would be required to submit a medical certificate describing you are fit enough to drive. Along with the application, you will submit the attested medical certificate, after which the license would be issued to you. Getting a medical certificate is also necessary while you are applying for courses such as that of a pilot. These courses require you to get a medical fitness certificate from a top grade doctor only after which you are deemed fit to fly. Similar to driving license here too, you are required to present an attested copy of the medical certificate for verification. If you are planning to indulge in adventure sports such as trekking and or skydiving, remember the organizations offering such services which ask you to present a medical fitness certificate. So these are few of the many areas where a medical certificate is required. Talking generally there is only one type of medical certificate issued in a particular nation, though the template may differ however content more or less remain the same. There are classifications of medical certificates based on the category for which it is issued. For example, in U.S there are three types of medical certificates aside from the one issued for common use. These are Special Issuance certificate, HIMS certificate as well as CACI certificate. Similar categories of certificate do exist all over the world however all portray same information in one way or other. Medical certificate is one of the most important documents which are asked for during foreign travel and or visa applications. You will be asked to present a medical certificate certifying your fitness and vaccinations against common diseases so that you don’t carry them on board to a new nation. This certificate might be in a local language and the embassy authorities may ask you to get a translated and attested copy of same. Advika Translation can help you with all these documentation and carry on the medical certificate translation and attestation on your behalf, thereby keeping you free from any travel or fatigue. If you require our medical certificate translations and or attestation services feel free to reach out to us and we would be more than happy to assist you with same. Are you looking for Certified translation of Payslip ? We at Advika Translations, translate payslip or salary slip from all Foreign languages like: German, French, Dutch, Spanish, Russian, Turkish, Chinese, Japanese, Polish and Portuguese etc. to English language. Our certified translations can be further used for submission to Income tax Department, Banks, Insurance companies, Embassy, Government department in India and abroad for Official, Legal, Immigration purposes. Our services are available in all cities and states of India and have express services available in Delhi, Mumbai, Pune, Bengaluru, Hyderabad, Chennai, Cochin, Gurugram, Noida etc. A salary slip or as many people call it the pay slip is a document which does contain the complete details of the salary being paid to an employee along with the deductions as well as taxes imposed. A salary slip helps an employee understand about his gross salary along with the salary which was credited to his account after making suitable deductions. Getting this slip an employee can be sure about the right amount credited to his account, as well as the same will clear any of his doubts regarding his salary if he has. What Does A Salary Slip Contain? Although different companies may have different formats of salary slips which they send to their employees, there are a few basic details which definitely are present. The first information generally is the name of the employee along with his designation and the account number to which the salary has been credited. After this, the salary slip does contain the gross pay an employee is entitled to receive, i.e. the CTC which the company promised a candidate per month. Then comes the deductions made from this salary such as the tax and the PF deductions. It would then contain the in hand salary which has been credited to an employee’s account along with the descriptions such as the Basic pay, House rent allowances etc. Other companies might include information such as additional payments done for overtime, the rate per hour offered etc. however the basic template remains more or less the same. Where is Salary Slip Required? During your loan application process you will be required to present your salary slip along with other documents for the verification process carried on by the bank. Based on your current salary it is calculated whether you would be able to repay the loan you have applied for. It is one of the most critical pieces of documents which any bank would ask for from a salaried professional. You might in some cases be also required to present an attested copy of same. If you apply for credit cards you again will be required to present your salary slip only after which bank will evaluate your profile and hence give you a credit card. This salary slip is one important factor in determining the limit of your card, therefore, should be kept carefully. Your salary slip is also required in case you opt for a job change. The new company asks for your old salary slip based on which they might offer your salary in your new position. There is generally only a single type of salary slip which is issued to employees, however, the template of same may differ from organization to organization. Some companies do not offer salary slips regularly and you can always ask for the same from your employer if need be. A salary slip as we mentioned has numerous uses. One which we didn't mention previously is it serving as the proof of monetary security you have during a business or education visa application. However you might be required to provide a translated salary slip in case the embassy where you have applied for visa demands. Advika Translation can help you with the completed embassy attestation of the slip as well as translation of same should you require submitting it in any foreign nation. If you do have translation needs for your documents, and or require embassy attestation for same, feel free to contact us any time.